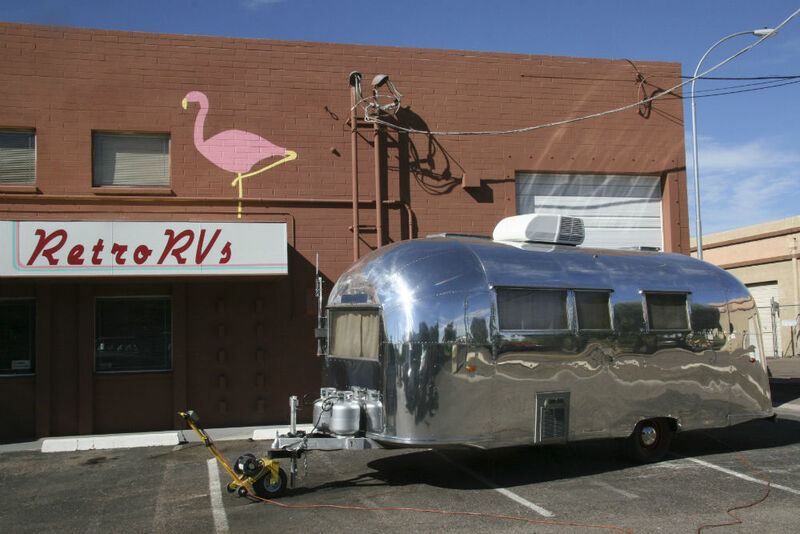 This early 60’s Airstream Safari is completely restored, only 22 feet long, only 2900 lbs dry, and she sleeps 2 currently. 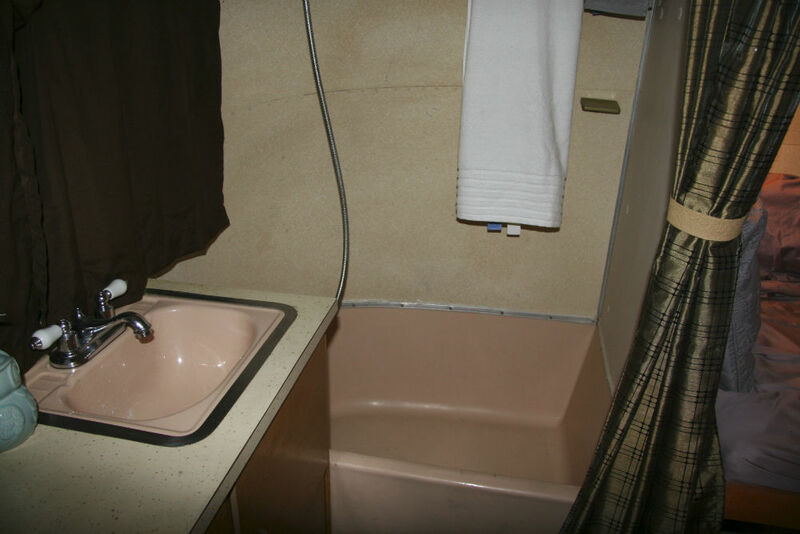 It has all the original fixtures, bath, and appliances and a recently polished outside skin. This trailer features a slide out couch in the bedroom that becomes a double bed and a rattan front loveseat which could be replaced with a gaucho-style couch in order to sleep 4 adults. A lot of time and effort went into restoring this trailer. It is a “park” model trailer, made for staying in RV parks. All of the lights and outlets and appliances work perfectly and the waste plumbing was just upgraded. 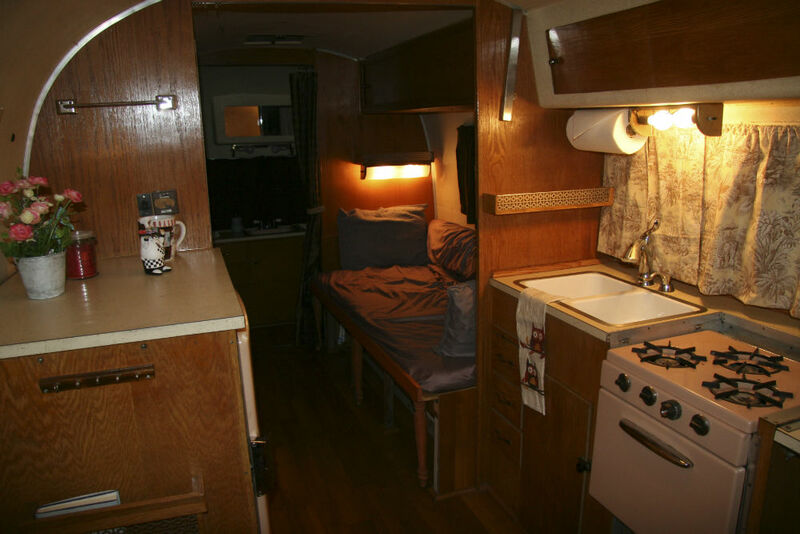 RetroRVs can also upgrade this park model to a self-contained trailer ready for boondocking. We hope that you enjoy the pictures and will contact us if interested! 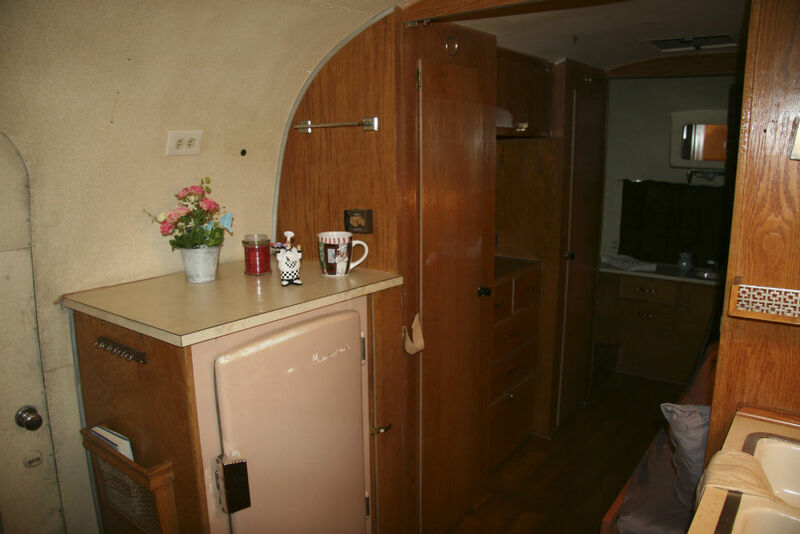 Looking forward from the center of the Airstream you can see the original kitchen and the forward window. The full yet compact kitchen has the original pink refrigerator and range, as well as the white porcelain double sink and original cabinetry. That pink fridge not only looks cool, it runs on electricity or a block of ice keeps it cold for days. The range looks like new, inside and out. This three burner gas cook-top has an oven great for cookies or pizza and completes the fully outfitted kitchen. It’s even large enough for a Thanksgiving turkey. And what a great family tradition that becomes! A white porcelain double sink lets you clean up fast so you won’t miss the sunset. 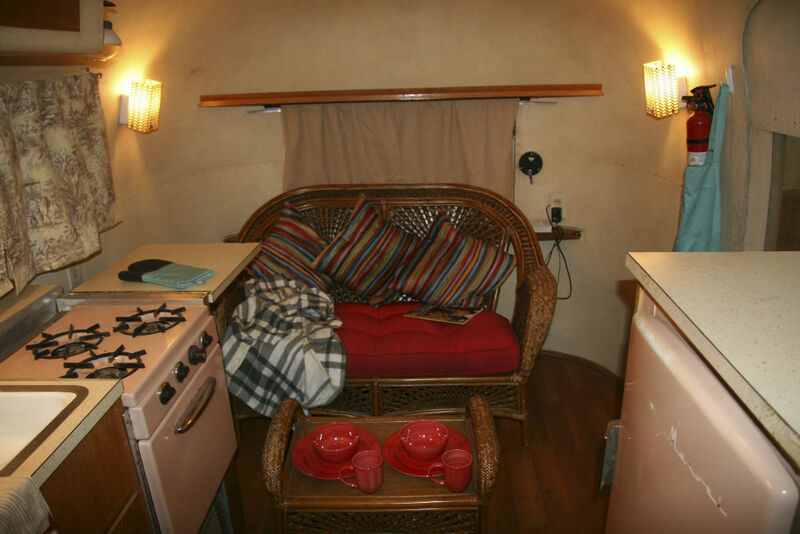 You can eat like kings while glamping because this kitchen is ready for your most ambitious gourmet camping meal. 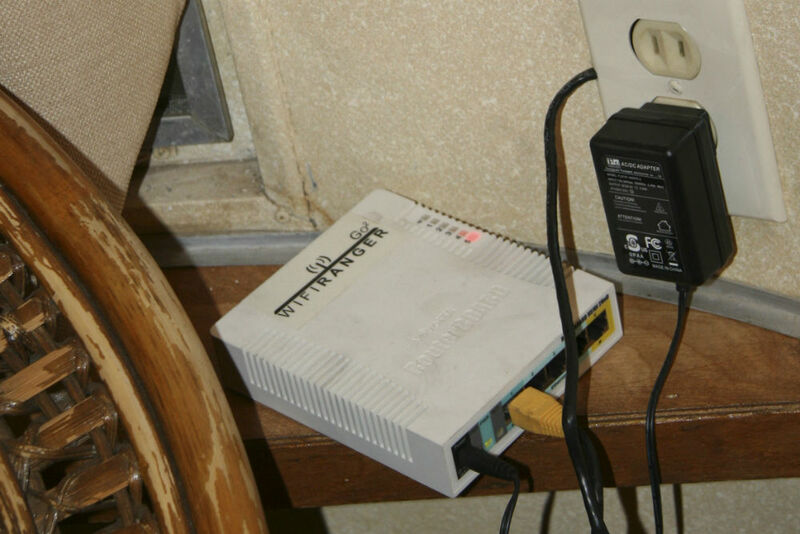 Alright, the WiFi Ranger is definitely NOT original, since it is the latest in campground technology. Receiving WiFi signals from up to 2 miles away, it sets up a private network inside the Safari (and just outside too) for all your electronic devices. So now when you move to the next campground, you only need to log into the WiFi Ranger and connect to the campground’s WiFi. Much faster & easier than connecting each device to the campground’s WiFi. It also sports an off switch, for when you don’t want to be connected. The Marvel refrigerator in the kitchen is pink. Pink was very fashionable in 1961. 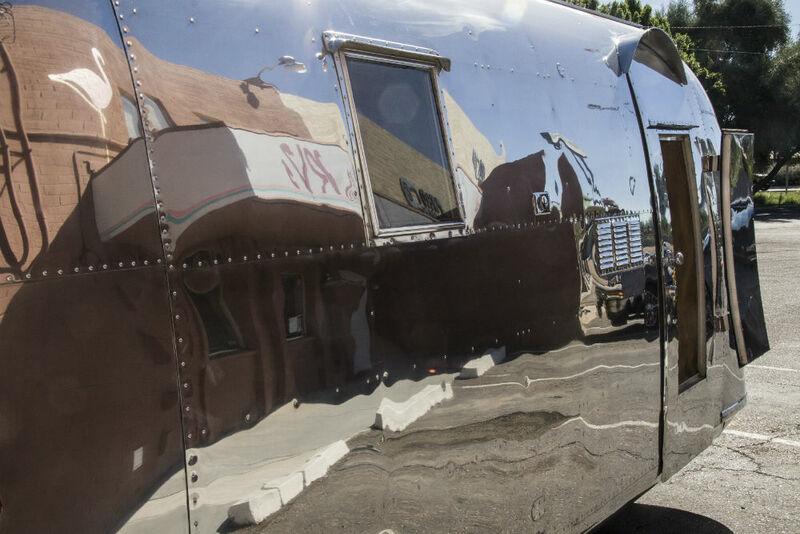 It turns this Airstream into a time machine. You can see the original Zolatone interior paint is in great shape too. The twin full height closets flanking a chest of drawers for plenty of storage. Enough room to dress for cocktails, if you want. 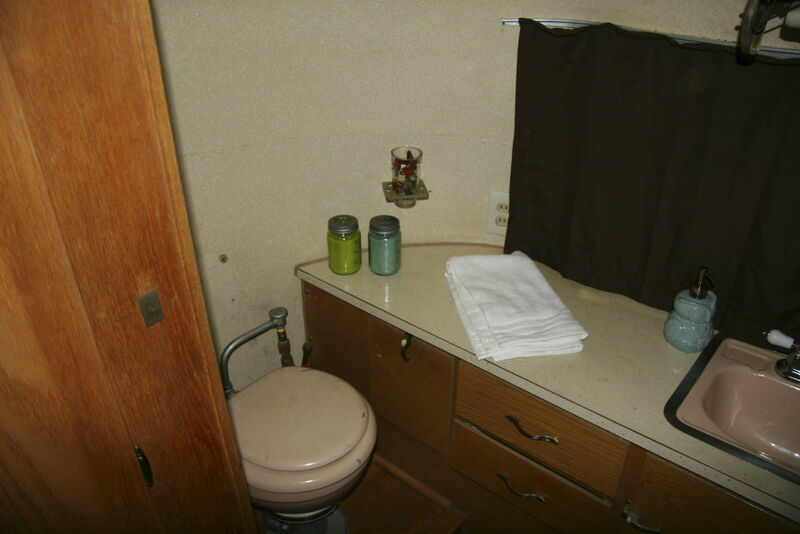 The bathroom has all the original toilet, sink, and tub. Even the shower head is original. The toilet has reached the end of its life, and parts are no longer available. So it will be replaced by a new yet retro-looking china toilet. No midnight treks across the campground for you! Refinished cabinets hold the original period perfect countertop and pink sink. The bathroom faucet has been replaced with a new retro-looking faucet. The fresh water pipes have also been replaced with PVC pipes. The original bath tub, shower faucet, and shower head mean a private hot shower instead of a group shower in the shower house for you. This full bath across the back-end gives you all the comforts of home. The fresh water plumbing has recently been replaced and the waste plumbing has been upgraded including this modern dump valve. This means the Safari is ready for the gray water tanks needed for boondocking. In an RV park, you remove this cap, hook up the “stinky slinky” sewer line, and open the gray valve. 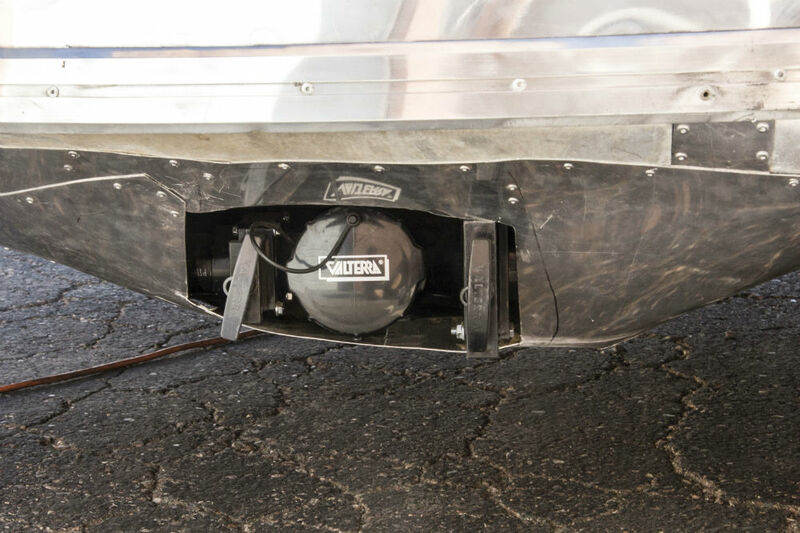 When you are ready to break camp, open the black valve and drain the tank into the campground’s system. Close both valves, rinse & stow the “stinky slinky”, replace the cap and you are ready to roll to your next adventure. The Safari features red wheels and baby moon hub caps. Add some wide white wall tires and you will be really be riding in the glove. 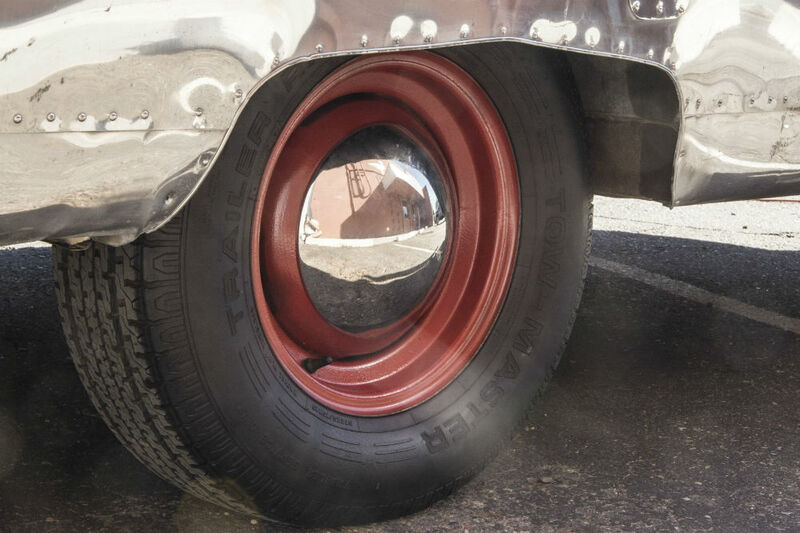 These carry the trailer and its highly polished aluminum skin with style. The single axle makes the Safari easier to maneuver and you get better mileage pulling a trailer with fewer wheels. The outside of this 1961 gem has just been polished. The skin is in excellent shape. She will sure get the attention she deserves and will become a landmark in any campground. The door within a door gives you an instant screen door. They are much sought after today. You can also see the outside unit and antenna of the WiFi ranger mounted to the TV mast up front.